UDFCD’s Flash Flood Prediction Program (F2P2) operates from April through September providing local governments with heavy rain forecasts and early flood threat notifications. The F2P2 has served the Denver/Boulder metropolitan area continuously since 1979. The forecast products described below are designed to identify potential and imminent flood threats affecting the District. They are prepared by a private meteorological service. Beginning on May 1, this daily product is available by 11 AM. The HPO provides a rain forecast for the District describing where storms are most likely. 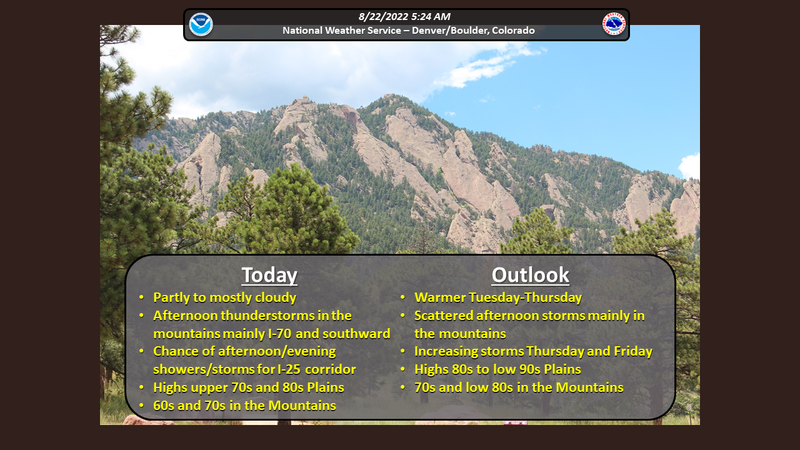 When the potential for flooding exists, this product is renamed Internal Message Status or IMS and will note the Message status for each District county (Adams, Arapahoe, Boulder, Broomfield, Denver, Douglas and Jefferson). This product is only available on days when the one-hour rainfall potential exceeds 1.5 inches. The QPF contains more basin-specific information than the HPO and requires some knowledge of the region’s major watershed areas, streams and associated flood hazards. Expected rainfall totals, storm duration, peak intensities and occurrence probabilities are provided. This is a short-lead forecast showing where a storm has formed or is forming, the approximate size of the storm, the direction (or track) of the storm, and the estimated arrival times at points along the forecast track. This is a highly anticipated product of the F2P2, but it is only available within an hour or less of a storm’s impact. Also, the ST is not prepared for storms that are not considered a flood threat. Standard messages are issued to warning points in each of the seven District counties. Dispatchers disseminate the information according to procedures unique to their respective jurisdictions.